I’ll be honest with all of you, when I first saw this car I didn’t see a Honda Civic. I saw a set of beautiful (and big) 19×10 and 19×13 HRE wheels sitting beneath something that was yellowish. 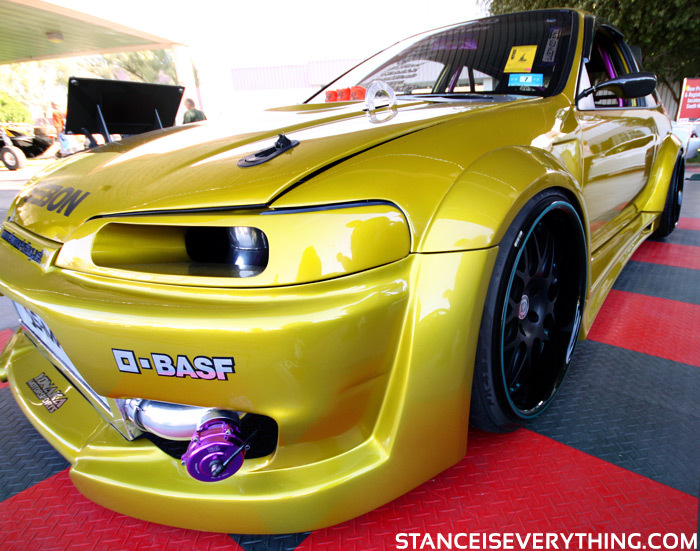 Once I was able to take my eyes off the wheels I noticed that they were attached to what was perhaps the most modified EG hatch I had ever seen, as Gwen Stefani would say that sh!t was B-A-N-A-N-A-S. This car is exactly the type of thing I expected to see at SEMA, over the top well built cars that pushed the borders of whatever platform they were built on. From the custom Candy Yellow covered wide body to the clean black suede double stitched interior every bit of this car has been modified. This car dances on the line of ‘too much and just enough’ and the decision on where exactylu it falls is really up to the person looking at it. Regardless the above is a custom car with, Mugen, Seibon, Willwood, Backyard Special and Stack parts, not to mention the Acura RSX type-s K-20 motor sitting in the shaved engine bay beside a SC372 turbo, and of course the aforementioned huge HRE’s. This thing has some very poor panel gaps…Overall, I think it’s a bit much. The color doesn’t appeal to me and those wheels seem to large and not very effective…But that’s just my opinion. @ Joe picture 3 specifically regarding panel gaps? I’m sort of wondering if they would tighten up with the hood latched down but ya I feel for the body guy custom fenders + custom bumper + cf hood. I can see him in a pile of sanding dust now. It is def way to much for me but hell I’d jump at the opportunity to drive it. @Dave Yea pic 3 it is really noticable. On pic 1 (i’m not sure if it was the angle from which you shot it) but the bottoms of those doors don’t look they fit right either. i dont know what all those negative talk is about let me see ur whip this is the sickest hatch period he been doing this for years theres crazy mods and money in this vehicle which by the way turns on and is driveable built for events just like this the whole point of modifying a car is pushing it to the limit while still functional my opinion is this >>>> unless u gonna pull up and park something thats built better right next to the car you talkin about leave the negative out Go hard or go home…STANCE IS EVERYTHING! 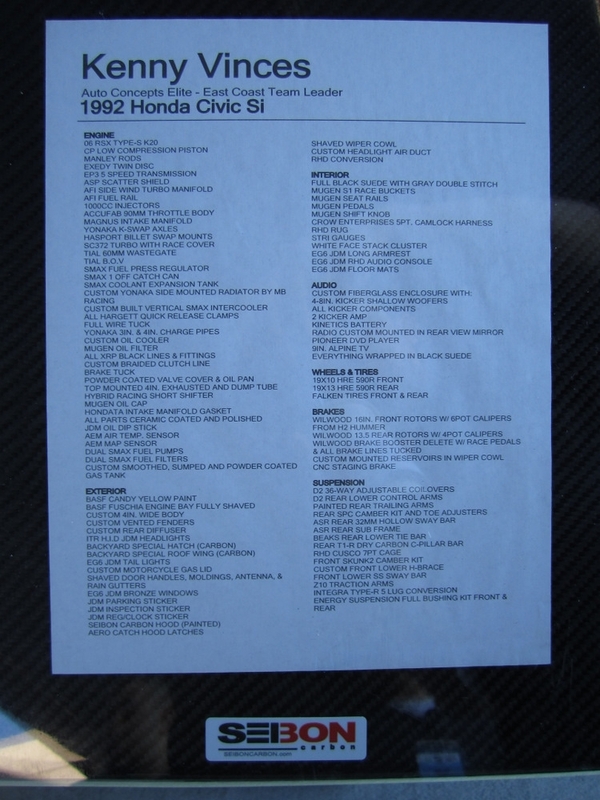 Hmmm hood is opened in all those pics and if you find me a 18yr old car with perfect panel fitment then your the man!!! Car is very well built and to those that hate it,, let’s see your cars!! I’m just saying,,, not for everyone but non the less sick!!!! Thumbs up!!! Your car is really impressive in person.